There is one temperature reconstruction of the last millennium that skeptics love to hate. And there is another that skeptics idolize in its place. The one is the ‘Hockey Stick’ northern hemisphere reconstruction, while the other appears as a schematic global trend line in the First Assessment Report of the IPCC. But neither graph is any good. They both obscure and distort the underlying science. Moreover, the skeptic’s idol itself usurped yet another dubious graph that reigned through the late 1970s and early 1980s. Thus, since global climate change anxiety emerged in the 1970s, we find a succession of three iconic millennium temperature graphs, each as different from the other as they are obscure in their scientific grounding. What is strange is that such plastic transformations are not found with the conventional reconstructions at smaller and larger timescales. The trend on the geological scale was only being refined over the same period. The large scale 100-year trend line has been more controversial. But both have maintained their general characteristics throughout the cooling and then warming alarm. So, what is it about the 1000-year timeframe? In the next couple of posts we uncover the origins of the two predecessors to the Hockey Stick. While the earliest version is as obscure in its origins as it is forgotten today (Part II), the other remains the idol of the skeptic (Part I). And so smash it we do! fig. 1: The IPCC First Assessment offered this unreferenced schematic diagram of global temperature variation across the previous millennium. It clearly shows nearly 4 centuries during the Middle Ages warmer than the beginning of the 20th century. A global Medieval Warm Period (global MWP) warmer than the thermal maximum of the 20th century is a skeptic’s myth first propagated by the IPCC in a single aberrant graph. Since the 1910 Geological Congress in Stockholm when the idea of a period in the Holocene generally warmer than ‘the present’ was first proposed on good evidence, until this graph was publish by the IPCC, paleoclimatology hasd never known a school of thought proposing such a period occurring during the Middle Ages. Clearing up confusion surrounding this topic is important for skeptics. Here we argue—and very much from the sceptical side—that, if ever this debate is going to rise above a political-motivated stoush, then we must get rid of the Medieval Warm Period where it is proposed globally. An impressive global temperature graph showing a MWP rising solidly above a mid 20th century thermal maximum appears in the First Assessment Report published by the IPCC in 1990 (fig. 1). However, this graph not only misrepresents its sources but it misrepresents the science of the time, including that discussed in the accompanying text. Nonetheless, it has become the idol of the manmade climate change skepticism that emerged on the blogs in the wake of the Hockey Stick controversy. Sometimes it seems that everything that is wrong about the Hockey Stick and contemporary paleoclimatology reduces to a sly campaign to get rid of the MWP. At other times this chart is posted so as to play off the IPCC against its earlier self. Either way, the hoisting of this idol again and again only serves to oppose one form of pseudo-scientific dogma with another. What is left out is what is really worth defending in this controversy, which is evidenced-based science. For some three years now, every time this writer witnesses yet another affirmation of this idolatry he is sure to post a cautionary comment. These comments sometimes elicit angry responses, and he is often mistaken for a trolling dogmatist of that other variety. Certainly, more explanation is required than what might be posted in a blog comment. And so, in the first part of this essay on millennium idols, here at last is an expanded explanation for why we must smash this one. To begin, and before losing this blog’s target audience—i.e., those skeptical defenders of evidence-based science—let’s clear up two common confusions. The first of these confusions is between local and global phenomena. There has never been any dispute of any consequence in the scientific literature that something remarkable occurred in the north Atlantic around the 11th and 12th centuries AD. All sorts of evidence suggests that around this time Greenland, Iceland and the Atlantic fringe of Europe experienced a climate at least as warm as that experienced there in the 20th century. Moreover, there is lots of evidence suggesting other regions of the middle and higher latitudes experienced similar warm anomalies between the 10th century and the 15th century AD. If this is all that is been proposed then there is no dispute. What would be cause for dispute is not regional variations, and inter-regional oscillations, but a proposal that at this time there was an overall warming of the atmosphere, if only as expressed in a reconstruction of global mean surface temperatures. That is what the IPCC graph suggests, and it suggests this in contradiction to the contemporaneous science. By the 1960s and 1970s the evidence was not at all heading in that direction. Instead, it was noticed that the climate anomaly of Eastern Europe of the 11th and 12th century was more moderate—and more moderate again in parts of Asia including China. However, regional peaks were noticed in surrounding centuries. Thus, when a northern hemisphere temperature anomaly (such as the Hockey Stick) does not show a distinct MWP, this does not necessarily contradict previous scientific evidence of localized excessive and sustained warming events early in the last millennium, whether in the Atlantic or elsewhere. Moreover, a reconstruction expanded to include the southern hemisphere would be expected to show even less synchronicity with the anomaly in the North Atlantic. By the 1980s there was widespread awareness that the south tends to behave quite differently, and global changes (whether Ice Ages or the 1940s warming or the 1970s cooling) were often found more moderate in the south (see e.g. Hansen’s 1981 chart). The second confusion is of the characteristics of this Atlantic phenomenon with two other climate phenomena that did appear to be global in extent. These are the Holocene Climate Optimum and the Little Ice Age. Due to the slow melt of the ice sheets in places like Canada, the regional peaks of the Holocene optimum seemed to vary. But, for 100 years up to the advent of the IPCC, the evidence had only been building that the globe was significantly warmer than the 20th century for many centuries around the dawn of agricultural civilization, around the 7th and 6th millennium BC. Since that peak there has been significant variability on a regional and global scale (including the MWP and earlier warming in Roman times and before). But, otherwise, there is little dispute that an overall small and gradual decline is noticeable across the millennia. The variability along this decline includes a particularly cool period around the 17th century AD. This cooling has long been characterized by accounts of advancing glaciers and famously cold events across Europe. But for a long time now paleoclimatology has proposed a much more widespread cooling that impacted the global mean—and from which the global mean has subsequently recovered. With these confusions pushed to one side, we can say that for a long time before the IPCC First Assessment Report, the science has been in general agreement on some very general features of climatic variations during historical times. There have been periods when the global mean temperature averaged across decades or centuries seems to have hovered slightly above or slightly below 20th century levels. But only one of these climatic variations had been identified during the last millennium as impacting on a global scale, and it was not a warming. Those who wish to argue that the recent science fanning the global warming scare is not only poor or corrupted or pseudo-science, but that it also contradicts—or serves to whitewash—previously established science of a global WMP, then they need to make their case by avoiding these confusions. They need to point to the published science of the 20th century proposing a MWP exceeding the warming of the 20th century in a mean temperature reconstruction that purports to be global. Whether descriptive or graphic this writer has never seen such science. Not before that IPCC graph. Indeed, not before the IPCC graph has there been found science supporting such a warming pushing out a peak in a well distributed northern hemisphere mean. For Europe, yes. But where there is any reference to evidence from central Asia, no. Was there such science? Perhaps we have missed it. Now there’s a challenge for anyone who wants to take it up! If this assessment of the state of paleoclimatology up to the IPCC First Assessment Report is correct, then it must be asked from whence came the idol of the skeptic? What is the source of that graph which purports to show the global trend complete with its huge smooth bump between 1000 and 1400 AD? To find out, we need to revisit late 20th century paleoclimatology. By the 1960s, temperature trends on the geological scale were well covered. The more sophisticated dating methods introduced around this time mostly confirmed and gave precision to what had already been traced in the advance and retreat of the ice sheets back and forth across the northern land masses over the last 100,000 years and more. The discovery of varves in the late 19th century brought geological time down to a conjunction with historical time, and varves research (combined with research on other proxies) quickly produced general agreement on a warmer climate earlier in the present interglacial phase—there was even speculation of an ice-free arctic. By the 1960s, the temperature trend across the scale of living memory was also covered. Various attempts had been made to construct a temperature trend for the northern hemisphere, and even for the entire globe, mostly from land-based weather station data within the last 100 years. These all presented general agreement in a rise out of the 19th century up to a peak around about the 1940s, followed by a moderate decline that seemed to be continuing. What remained missing by the 1960s was an understanding of temperature variation on the time scale between the geological and the instrumental scales, namely, century-scale variability across historical time. And this is where the British paleoclimatologist, Hubert Lamb, stepped in and produced one of the first millennial temperature reconstructions. The only trouble was, as a British Met Office employee, and the founder of the British Climate Research Unit, the attention of his considerable research remained fixed locally. While his interest extended to a general history of European climate, he was mostly interested in England and the British Isles. Before Lamb, regional climate trends pushing back as far as three centuries had already been advanced. In the first place this was attempted by utilizing early instrumental series that have been preserved right back into the 17th century. While recognized as too inconsistent, too unreliable and too sparse to indicate a global trend, from the 19th century attempts had been made to chart local and regional variations back this far. Others charted local and regional variations through descriptive accounts, including weather records, agricultural records (e.g. harvest records), and though proxy evidence such as in lake levels and the advance/retreat of glaciers. In the late 19th century Eduard Bruckner had already used instrumental, descriptive and proxy data to trace oscillations between cool-wet and warm-dry climates from the late 17th century. This trend he found synchronous across the northern hemisphere, and even in Australia. Early in the 20th century proxies derived from such sources as tree-rings, variation in alpine and northern tree lines and lake sedimentary deposits produced climate indicators reaching much further back into the Holocene. But it was not always clear whether temperature was being measured, and, anyway, the early interest was much more in indications of agriculturally favourable/unfavourable climates. Where a specific variable was of concern, it was usually precipitation. (More on historical GMT graphs). fig. 2: Hubert Lamb’s millennium temperature charts for central England, first published in 1965. This copy is from the book cited elsewhere in the IPCC First Assessment Report, Weather, Climate and Human Affairs, 1988. Click to enlarge. From the mid-20th century interest was shifting towards temperature. Instrumental temperature records are found best preserved in the early centers of science, which included no less England. Often under the auspice of the Royal Society, various records were kept right back into the early days of the Enlightenment. In 1953 Gordon Manley was able to publish a temperature series for central England (CET) back to this time by homogenizing various records. He relied on a whole variety of records of varying quality mostly from locations in the region, although he does note that for an important period of missing local data (1707-1722) the primary source is a station across the channel in Utrecht. Nevertheless, Manley’s series was soon acclaimed the longest and most impressive temperature reconstruction base on actual thermometer readings. And it was Manley’s series that Lamb, in the early 1960s, set about extending by descriptive and proxy data, right back into the first millennium AD. The late tenth to early thirteenth centuries (about AD 950-1250) appear to have been exceptionally warm in Western Europe, Iceland and Greenland. This period is known as the medieval climate optimum. China was, however, cold at this time (mainly in winter) but South Japan was warm (Yoshino, 1998). The reference to a cold China and the absence of any mention of regions south of the equator leaves no suggestion of a global phenomenon. This is by contrast to the text above, discussing the Holocene optimum, and the text below, discussing the Little Ice Age. On the Holocene optimum it talks of ‘growing evidence that worldwide temperatures were higher than at present,’ and it mentions China, Japan, the USA as well as Australia and Chile. Of the Little Ice Age, it says that it ‘was probably the coolest and most globally-extensive cool period’ since the last ice age. Thus, the text of the IPCC First Assessment Report gives a fair summary of the state of the science at the time—but in contradiction to the accompanying 1000-year chart of global temperatures dominated by the large MWP hump. Curiously, what is also found inserted in this discussion are unexpected claims against CO2-driven climate change. This is where the brief description of the Holocene and Medieval warmings are noted for bearing no association with increased concentrations of carbon dioxide. The section ends with the suggestion that some of the global warming since 1850 could be a recovery from the Little Ice Age ‘rather than a direct result of human activities.’ These asides on the attribution of climate change are out of scope for a chapter (Chapter 7) which is supposed to be only discussing observations of climate change. Indeed, the following chapter (Chapter 8), which does directly address the question of attribution, is even more skeptical. But that is another story. fig 3: Page 202 of the IPCC First Assessment Report showing the complete set of schematic temperature charts and the accompanying text. On p202 of the IPCC First Assessment Report (fig. 3) where the millennium chart appears, it will be noted that it does not stand alone. In fact it is the last of three charts on successively larger timescales. As usual, the geological scale chart at the top is uncontroversial in its trending of the previous ice ages. But let’s consider the graph in the middle, which charts the last 10,000 years across the best part of the Holocene. In one respect this chart presents a most unusual shape when compared to other charts spanning the same timeframe. The recent warming bumps (Medieval and Roman?) are most pronounced; indeed they are almost as high as the Holocene optimum. The source for this graph remains unknown, but one thing is for sure: if it were from Lamb’s paleoclimatology of England then it is a gross distortion. fig. 4: Hubert Lamb’s Holocene temperature charts as published on page 88 of Weather Climate and Human Affairs, 1988. Note the ovals of uncertainty and the dots on the right giving recent centennial means. Click to enlarge. 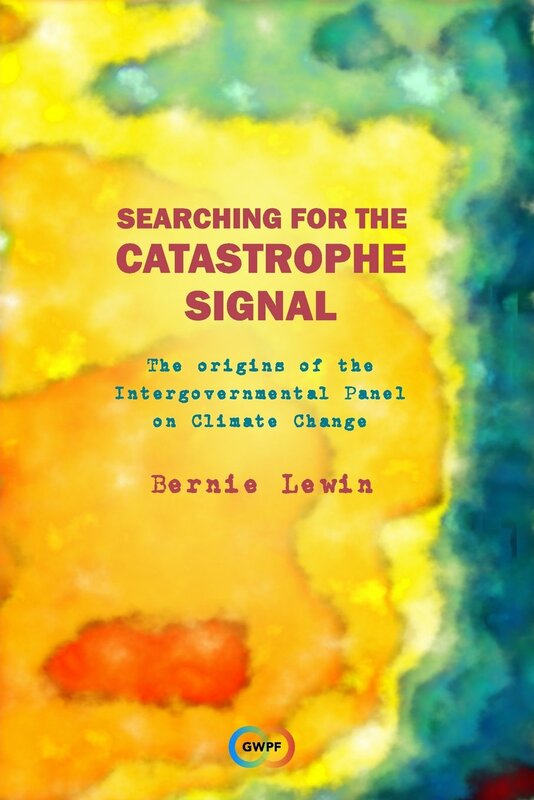 From the late 1970s, in his studies of the past climate of England, Lamb also gives the summer and winter Holocene trend, but this time his graphs are very different from the one appearing in the IPCC report. The most common version of Lamb’s Holocene graphs are given in fig. 4, which is as they appear on page 89 of the text we have already noted as cited by the IPCC report, Weather, Climate and Human Affairs. What is striking about Lamb’s graphs is just how miniscule and insignificant the recent trends across the last few millennia appears by comparison with the overall trend—and this is especially so when it is realized that a rise in winter temperatures during the first millennium BC is compensated by a summer cooling. Lambs Holocene charts are also worth contemplating for the way they deal with uncertainty, with variability at different scales, and with what is often referred to as the problem of variance in ‘resolution.’ In both the summer and the winter graphs the main temperature line is smoothed to a 1000-year mean. One reason for this can be found in the width of his ‘ovals’ of uncertainty, which sometimes extends to 1000 years. In recent centuries this uncertainty is much reduced so that across the last millennium ‘resolution’ can be achieved to a centennial scale. Lamb uses dots to present values at this resolution. Thus, the MWP, which is lost in the 1000-year smoothing, can still be seen represented by two or three dots riding above the line. What this suggests is not that recent times are more variable than earlier times, but only that any such variability in earlier times remains hidden due to the low grade resolution of the older data. So, while it is tempting to run the main line through these recent centennial means, this would be a distortion. And here is the weird thing. We might expect that the last 1000 years of the 10,000 year graph should match in miniature the expanded larger scale version of the same period. But Lamb, with his dots, shows why we should withhold this expectation. That such a matching is evident in the two lower charts of the IPCC set (fig. 3), and with the MWP hump appearing in both, this suggests why the Holocene chart might be distorted at the end: if by some erroneous means, a centennial value (say, a value for the 12th century) were included in 1000-year smooth graph, then it could make a recent variation (say, an English MWP) much more distinct. To propose something like this to partly explain the unusual shape of the IPCC graph is only to suggest an error common to recent paleoclimatology. Such an error of linearly smoothed data at different temporal resolutions is common in recent climate change science. We find it in the graph used by Hansen in his congressional testimony of 1988 (fig. 1, p47), where a seasonally adjusted 5-month mean for the current year provides an outstanding centennial peak continuous with a 1-year (and a 5-year) running mean. And more recently we find this error in the Holocene-extended hockey stick of Marcott et al (2013). But even granted such a distortion to the IPCC Holocene graph, in Lamb’s Holocene chart the dots of the peaks of the (centenary scale) variability of recent centuries remain way below the (millennium smoothed mean) line running through the Holocene optimum. Thus, according to the world’s most renowned proponent of MWP, even as a regional event this warming fades into insignificance when viewed across the entire history of human civilization. So, what can we say about the IPCC millennium graph dominated by that huge medieval hump? On the one hand, in itself, it is much less than a poor assessment of the science. It is a gross distortion. But on the other hand it is only an aberration; an error in contradiction to the text of the report itself. Labeling this graph ‘global’ was perhaps a careless mistake or else a singular error of judgement. But it did pass peer review. And what is surprising about the passing of this error is not that such gross errors pass muster in IPCC reports. Some notorious claims that directly contradiction agreed science have come through the rigorous review process over the years. But they mostly work in favor of global warming alarm. So, what is surprising is that this error so graphically works the other way. It is saying: the recent warming is not so great, not so unusual and so perhaps no cause for alarm. After all, that is why it became the skeptic’s idol, and that is why the MWP has been the bone of so much contention in the controversy ever since. The survival of this schematic of recent global temperatures suggests the influence not of alarmism, but rather of a counter current of skepticism evident throughout those sections of the IPCC report concerned not with climate modelling, but with empirical science. This skepticism is found especially strong in this section of Chapter 7 (on observed variability) and right through the brief following chapter on human attribution. Therein we find the sobering assessment of the degree of natural variability; therein the difficulties of attributing recent warming to the human influence. This part of the assessment throws a blanket over the warming alarm of the late 1980s. It is towards the text of these chapters that attention should be drawn, and not towards the unreferenced, falsely labelled imposter that has become the skeptic’s idol. Note 1 (UPDATE): I understand that an account of the source for this graph in the work of H H Lamb was first published by Steve McIntyre on Climate Audit 9 May 2008. My apologies to Steve for not noting this in the original posting. Note also this Wikipedia entry where Steve is not credited. Now, take a look at the millennium graph in Fig 5. Compare it with the one we just considered and with the Hockey Stick. It’s another thing altogether! Versions of this graph would be used again and again in USA climatic change assessment reports through the late 1970s and flowing on into the reports on the risks of CO2 emissions in early 1980s. It was only after 1988 that this graph fell off the stage. So, from whence did it arise? Curiously, its origins are also in Lamb’s work. But its origins there are even more obscured. It turns out that its source data also come from a tiny patch on the globe’s surface. But this patch is not in Britain and nor is it in the USA. And it is not even temperature that is being measured. Strange as it may seem for the height of the cold war, the origins of this graph are in a winter severity index for the region of Moscow. How an historical index of winter severity in the soviet capital came to represent the global temperature trend in a series of US climate assessments, this is the story we take up in Part II. This entry was posted in Climate Change Science, History of Climate Science and tagged Hubert Lamb, medieval warm period, Millennium temperature graphs. Bookmark the permalink. Tibetan Temperature Reconstruction Shows Medieval Warm Period Was Warmer Than Today! Thanks Peter, I would be interested to see papers from before 1990 that provide evidence of a MWP warmer than the 20th century and synchronized globally. I have not found any yet. I do not dispute that recent papers make this claim. But I will add that I often see the claim made without properly addressing the problem of synchronicity. Claiming Lamb’s graph as an “IPCC” one is misleading since they did not originate it or first publish it. Incidentally unmentioned is that Lamb was founder of the now alarmist CRU – presumably his reputation was good enough for them to make use of. Also unmentioned is that Greenland ice measurements of temperature essentially confirm Lamb’s work. That the written records, at least in European languages, of the MWP, 1,000 years ago, are better in Europe than, say Australia is not actually evidence that it was limited to that area. The Principle of Mediocrity requires one to assume it was a global phenomenon (both sunlight and atmosphere being distributed around the globe) until there is evidence otherwise. The most relevant paper is that of Libby and Pandolfi 1979 that found periodicities in the temperature records extracted from tree ring using isotopic analysis – the paper also refers to other isotope studies in tree rings and sea bed cores. Such isotope measures have proved to be more accurate that the ring width studies of Mann et al. Some details of the Libby and Pandolfi paper are given in the following – the paper itself is behind a pay wall. I would be interested to see papers from before 1990 that provide evidence of a MWP warmer than the 20th century and synchronized globally. I have not found any yet. I do not dispute that recent papers make this claim. But I will add that I often see the claim made without properly addressing the problem of synchronicity. I don’t understand this response. Peter Aziel has provided you with no less than 20 scientific papers establishing the existence of the MWP in various parts of the world. He has also pointed to CO2 Science, where there are many more. And that is your response? You ignore the comment about Lamb, and claim that you want to see earlier papers? I don’t understand how the time when the papers were published affects their validity, as you seem to be claiming. If they’re true, they’re true no matter when they were published. Don’t mistake my position. I have no love for either graph, I find both of them doubtful. I’m just saying that you haven’t come anywhere near establishing your claims. The claim is that that the graph is FAR fig 7.1c misrepresents the science behind it, which is the science behind Lamb’s graph. It misrepresents it because Lamb’s graph gives the trend for a tiny patch of the globe, namely England. The graph in FAR purports to give the global trend. It is clear from Lamb’s work that he would never make this claim. In a number of the papers where this graph appears he shows in other graphs how it does not even give the trend for eastern Europe. My point is perhaps too much steeped in the history of science for your liking (but that is what this blog is about). Let me try to make it again in a different way. Q. How does one support the claim of a global MWP? A. By using good science. Q. Is the global millennium graph in FAR fig 7 good science? A. No. It distorts the underlying science. Q. Do more recent papers/graphs support the case for a globally synchronized MWP warmer than the 20 century? A. If yes, then it is better to use these papers to support the case. They do not. The question is historical. The text of FAR suggests that the Holocene optimum and the LIA were global. But it talks about the MWP as local. My interest is whether this is a fair assessment of the science in 1990. My hypothesis is that it is. In this regard I hereby thank Peter for the reference to Libby, L.M. and Pandolfi, L.J. 1979, but as yet I cannot see how this helps me. I am not sure what you mean. I presume you mean that I say FAR provides no source for its graph fig 7.1c. It does not. I thought everyone agrees with that. The presumed source is Lamb’s extension of Manley’s CET. I discuss this, complete with images, and I thought everyone agreed with that. May I say again, as I said elsewhere, I regret that I did not mention Steve McIntyre’s role in exposing the source of this graph. I will correct this. I find both of them doubtful. If you find the FAR graph doubtful then you might agree with me that it is better left out of the debate. That really is my bottom line: don’t attack bad science with bad science. I thought there was a series of emails from the Climategate files where the source of this graph was discussed and the conclusion was that it apparently originated on the back of a cocktail napkin. Or was that about another millennium graph? I referred you earlier to the extensive data compiled by the Idsos at CO2Scince.org. There they have a MWP project summarizing all the peer reviewed science todate on the MWP with an interactive world map giving the site and details of each study. The list of authors and institutes is extensive and should leave no doubt that the MWP was global and warmer in most places than the end 20th century – to talk of global warming is not appropriate as even Berkeley Earth´s BEST study states that 30% of the meteorolgical stations analysed show cooling and we know that the land temperature depends on ocean temperatures and these ocean heat cycles differ by ocean basin. So we would not expectthe MWP to occur in exactly the same years on all continents. To answer your statement above the Idso project shows the results of Wilson et al from 1979 in New Zealand so we can at least say that at this time it was known that the MWP occurred in both the SH and NH. Temperatures derived from an 18O/16O profile through a stalagmite found in a New Zealand cave (40.67°S, 172.43°E) revealed the Medieval Warm Period to have occurred between AD 1050 and 1400 and to have been 0.75°C warmer than the Current Warm Period. This reference gives a good graphic that did not copy here! Peter, Thanks for the links. I think our point of disagreement is becoming more refined. You will note that I have modified my claim to meet your criticism. I would be interested if you could recommend a millennium time-frame graph giving the global trend — the best available today based on sound science. My view is that it would be better to point to such a graph and leave aside the FAR 7.1c graph — which is not a good look for skeptics because it distorts the underlying science. Some other comments: Pre-1990, with Lamb and others, they were generally working with smoothing to 50-years, 100-year and more. Note the discussion of the resolution issue above. Pre-1990 there was agreement about geological scale global warming/cooling trend despite lack of global coverage. Pre-1990 there was general agreement about global (or at least North Hemisphere) trended of warming from late 19th cent to mid 20 cent and then a pause or cooling despite large gaps in the sampling. My question is whether there was agreement on the time-frame in between. So far I have found that there was not much interest in this question at all. Instead climatologists like Lamb were using localized proxy data much as meteorologists use station data, that is, to find the patterns of change. It is from this work whence came the science of the various climate oscillations. So far I see that the need for a global millennium frame graph came with the demand for such graphs in climate assessments during the global climate change scares that began in the 1970s. It was not until the Hockey team that this demand was met. In the mean time regional graphs (my fig 5 then fig 1) were used in their place. Bernie, I’m not sure what you’re trying to get over here. You have put forward the view that Lamb’s picture is idolised in the sceptical community. I’m not a particularly bright specimen of the sceptical community, but I did know that the FAR chart was little more than a drawing,, and over around 8 years of dilettante scepticism, I have only seen it used twice, once by Steve McIntyre and once, I believe, by Christopher Monckton, although it could be someone else. In both cases it wasn’t used to demonstrate that there was a global MWP, but to prove that the IPCC originally thought there was a MWP. Maybe we don’t read the same sceptical sites, mine are Bishophill, WUWT, Climateaudit, Icecap, JoanneNova and Nofrakkingconsensus, oh, and Climatedepot. They are I believe the main sceptical sites, and to my certain knowledge everyone of them is aware that the Lamb drawing was from the CET. So I don’t understand why you believe this drawing is idolised by the sceptic community, who, if they wanted to could point to the hundreds of papers of global studies that indicate there was a period during the middle ages when the world was as warm, or warmer now in many parts of the world on the site CO2Science. If the IPCC did say it was a global representation of climate over the millennium and everyone and his dog knows it isn’t, what’s the problem? Other than you not seeming aware everyone knows it wasn’t a global reconstruction. No. Lamb’s England temperature graph(s) are not ‘pictures,’ nor are they idolised. I am saying that the schematic graph of the global trend in IPCC FAR 7.1c has been idolised by sceptics and used as a defense against bad science (eg the hockey stick). But we should not uses bad science against bad science if it is science that we are defending. We might do that if what we are defending is political opinion. In that case it is propaganda. To propose that this graph as derived from the scientific data indicates the global trend…this is absurd. Elsewhere in Lamb, elsewhere in 20th century paleoclimatology, the variability across the globe had been well established, thus making everyone very cautious about generalizing regional findings. If the only reason the graph is referenced is to show that the IPCC FAR assessed that there was a global MWP then that is not so bad. However, the text of the IPCC report contradicts that claim and instead gives the prevailing view of the time which its that a MWP with an outstanding peak in the high Middle Ages has not yet been found to be global. Thus, the schematic graph in FAR is not only unscientific but an anomaly in FAR. As such, we should be no more approving of it than of the claim that the Himalayan glacier might be gone by 2035. To say that there was a period during the middle ages that was warmer in many parts of the world…this is not in dispute. The dispute concerns global warming. To say there was a period during the middle ages when the world was warmer is a very vague claim, especially if you consider the middle ages to extend back into the middle of the first millennium AD. The IPCC FAR graph gives a broad peak around the 12th century. A peak centuries earlier or later would be a gross contradiction. Moreover, we are talking about the period of the last millennium, which is the period covered by the FAR schematic and the hockey stick. The hockey stick is not denying a warming peak earlier in the Holocene. I have been referred a number of times to a well known recent challenge to the hockey stick that gives the global trend. Below I reproduce it truncated to the millennium. I wonder which graph you think it resembles more, IPCC FAR or the Hockey Stick in TAR? Until about the mid-90s of last century the Medieval Warm Period was for climate researchers an undisputed fact. Therefore in the first progress report of the IPCC from 1990 on page 202, there was the graphics 7c , in which the Medieval Warm Period was portrayed as clearly warmer than the present. A brief check indicates a “warm MWP-consensus” before IPCC published the Mann hockey stick graph in 2001. …This indicates that the consensus of a WARM middle age before year 2001 was likely to be a real consensus. According to a figure in the 1990 IPCC report, 1100 to 1300 AD saw temperatures in the northern hemisphere that were higher than current levels. 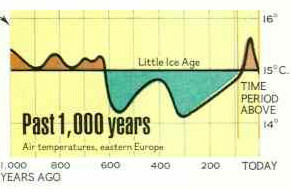 However, the IPCC 2001 report included the infamous so-called “hockey stick” chart that managed to make the Medieval Warm Period of about 1000 years ago disappear! In 1995 everyone agreed the world was warmer in medieval times, but CO2 was low then and that didn’t fit with climate models. In 1998, suddenly Michael Mann ignored the other studies and produced a graph that scared the world — tree rings show the “1990’s was the hottest decade for a thousand years”. The idea of a medieval warm period was formulated for the first time in 1965 by the English climatologist Hubert H. Lamb . Lamb, who founded the UK Climate Research Unit (CRU) in 1971, saw the peak of the warming period from 1000 to 1300, i.e. in the High Middle Ages. In closing, let me say that a lot of the problem is in the fudging and confusion on ‘medieval’ (Which centuries do you mean?) and on defining a ‘global mean’ rather than various regional peaks across 4 or 5 centuries. It is clearly nonsense to say that saying the MWP was worldwide was “as” unscientific as the IPCC’s deliberate about the Hinalayan glaciers being gone by 2035 – if only because the principle of mediocrity requires it assumed to apply across the globe unless shown otherwise. However if you really believed that and were not making a biased argument you would have had to spend as much time then denouncing the IPCC’s claims as you are now on this stuff. Please provide links showing you did.